Play FUT Draft & win rewards for your club! 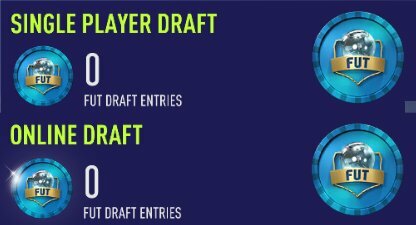 Check this guide on how to join and play FUT Draft. 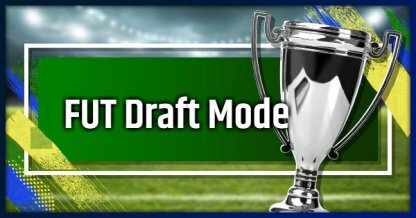 FUT Draft is a game mode within FIFA Ultimate Team that allows you to win rewards for your club by playing using a draft team. You can choose to play against an AI offline or against other players online. Online mode tends to be more competitive but offers better rewards! A selection of 5 players for each position will be presented to you and you will decide which of these players are a good fit for your draft team. You can play up to 4 matches in FUT Draft as long as you win. FUT Draft will end once you lose a match. Rewards come in the form of Packs and FUT Coins. Use these to improve your FUT team! The cost of entering the FUT Draft can be high, but the rewards can be worth it as long as you win. FUT Coins can be earned in-game and serve as the primary currency in FIFA Ultimate Team. Offline Mode (Single Player) pits you against an AI. You can set the difficulty of the game mode in the settings. Online Mode pits you against other players and the difficulty will be random. 5 possible formations will be available for you to choose. Choose a formation that you're comfortable with as this will be the same formation for all the FUT Draft matches you play for the session. Your captain will be one of your best players so it is best to build your team around him. Once you have you team ready, you can start playing the FUT Draft matches. You can play up to 4 matches as long as you keep winning in FUT Draft. A loss will immediately end your FUT Draft game. FUT Draft is a good way to earn rewards for your FUT club, especially when you have the skills to win all 4 matches. FUT Coins and Packs are the possible rewards you can get from FUT Draft aside from Packs. Use these to improve your FUT club, especially if you're planning to hit the trading market. The best rewards will come from having a series of wins with a 4-win streak having the best rewards. So it's best to put in a lot of practice before you try playing in FUT Draft.